The only surviving image of the Pythia from the ancient world. Berlin Museum (Berlin Mus. 2538). The Pythia (Gr. Πύθια) was the priestess presiding over the Oracle of Apollo at Delphi, located on the slopes of Mount Parnassus. The Pythia was widely credited with giving prophecies inspired by Apollo, giving her a prominence unusual for a woman in male-dominated ancient Greece. The Delphic oracle was established in the eighth century B.C.E. Its last recorded response was given in 393 C.E., when the emperor Theodosius I ordered pagan temples to cease operation. During this period the Delphic Oracle was the most prestigious and authoritative oracle in the Greek world. The oracle is one of the best-documented religious institutions of the classical Greek world. 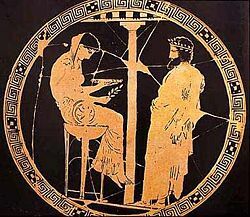 Writers who mention the oracle include Herodotus, Euripides, Sophocles, Plato, Aristotle, Pindar, Xenophon, Diodorus, Strabo, Pausanias, Plutarch, Livy, Justin, Ovid, Lucan, and Julian. The name of the Pythia derived from Pytho, which in myth was the original name of Delphi. The Greeks derived this place-name from the verb pythein (πύθειν, "to rot"), used of the decomposition of the body of the monstrous serpent Python after she was slain by Apollo. It is often said that the Pythia delivered oracles in a frenzied state induced by vapors rising from the ground, and that she spoke gibberish which priests reshaped into the enigmatic prophecies preserved in Greek literature. This picture has been challenged by scholars such as Joseph Fontenrose and Lisa Maurizio, who show that the ancient sources uniformly represent the Pythia speaking intelligibly, and giving prophecies in her own voice. Recent geological investigations have shown the possibility that ethylene gas caused the Pythia's state of inspiration. Several hundred prophecies of the Oracles of Delphi are known to have survived since classical times, of which over half are said to be historically accurate. There are many stories of the origins of the Delphic Oracle. One late explanation, which is first related by the first century B.C.E. writer, Diodorus Siculus, tells of a goat herder called Kouretas, who noticed one day that one of his goats, who fell into a crack in the earth was behaving strangely. On entering the chasm, he found himself filled with a divine presence and could see outside of the present into the past and the future. Excited by his discovery he shared it with nearby villagers. Many started visiting the site, until one of them was killed by the experience. From then, only young girls were allowed to approach the chasm and then in conditions regulated by a guild of priests and priestesses. According to earlier myths, the office of the oracle was initially held by the goddesses Themis and Phoebe, and that the site was sacred first to Gaia. Subsequently it was held sacred to Poseidon, the "Earth-shaker" god of earthquakes, a later offspring of Gaia. During the Greek Dark Age, from the eleventh to the ninth century B.C.E., the arrival of a new god of prophecy, saw the temple being seized by Apollo who expelled the twin guardian serpents of Gaia. Later myths stated that Phoebe or Themis had "given" the site to Apollo, rationalizing its seizure by priests of the new god, but presumably, having to retain the priestesses of the original oracle because of the long tradition. Apparently Poseidon was mollified by the gift of a new site in Troizen. "the Pythia was (on occasion) a noble[woman] of aristocratic family, sometimes a peasant, sometimes rich, sometimes poor, sometimes old, sometimes young, sometimes a very lettered and educated woman to whom somebody like the high priest and the philosopher Plutarch would dedicate essays, other times [one] who could not write her own name. So it seems to have been aptitude rather than any ascribed status that made these women eligible to be Pythias and speak for the God." During the height of the oracle's popularity, as many as three women served as Pythia, another vestige of the triad, with two taking turns in giving prophecy and another kept in reserve. Several other officials served the oracle in addition to the Pythia. After 200 B.C.E., at any given time there were two priests of Apollo, who were in charge of the entire sanctuary; Plutarch, who served as a priest in the late first century and early second century C.E., gives us the most information about the organization of the oracle at that time. Before 200 B.C.E., while the temple was dedicated to Apollo, there was probably only one priest of Apollo. Priests were chosen from among the leading citizens of Delphi, and were appointed for life. In addition to overseeing the oracle, priests would also conduct sacrifices at other festivals of Apollo, and had charge of the Pythian games. Earlier arrangements, before the temple became dedicated to Apollo, are not documented. The other officials associated with the oracle are less well understood. These are the hosioi ("holy ones") and the prophētai (singular prophētēs). Prophētēs is the origin of the English word "prophet," but a better translation of the Greek word might be "one who speaks on behalf of another person. "The prophetai are referred to in literary sources, but their function is unclear; it has been suggested that they interpreted the Pythia's prophecies, or even reshaped her utterances into verse, but it has also been argued that the term prophētēs is a generic reference to any cult officials at the sanctuary, including the Pythia. There were five hosioi,(the holy ones) whose responsibilities are unclear, but may have been involved in some way with the operation of the oracle. In the traditions associated with Apollo, the oracle gave prophecies only between spring and autumn. In the winter months, Apollo was said to have deserted his temple, his place being taken by his divine half-brother Dionysus, whose tomb was within the temple. It is not known whether the Oracle participated in the Dionysian rites of the Maenads or Thyades in the Korykion cave on Mount Parnassos, although Plutarch informs us that his friend Clea, was both a Priestess to Apollo and to the secret rites of Dionysus. The male priests seem to have had their own ceremonies to the dying and resurrecting God. Apollo was said to return at the beginning of Spring, on the seventh day of the month of Bysios, his birthday. This also would reiterate the absences of the great goddess in winter also, which would have been a part of the earliest traditions. Once a month thereafter the oracle would undergo special rites, including fasting, to prepare Pythia for the event, on the seventh day of the month, sacred to Apollo. Washing in the Castalian Spring, she then received inspiration by drinking of the waters of the Kassotis from the naiad said to be living in the stream that ran beneath the adyton (a Greek word meaning "do not enter") of the temple where she sat. Consultants, carrying laurel branches sacred to Apollo approached the temple along the winding upward course of the Sacred Way, bringing a black ram for sacrifice in the forecourt of the temple, and a gift of money for the oracle. Petitioners drew lots to determine the order of admission, but big donations to Apollo could secure them a higher place in line. The ram was first showered with water and observed to ensure that it shivered from the hooves upward, an auspicious sign that the oracular reading could proceed. Upon sacrifice, the animal's organs, particularly its liver, were examined to ensure the signs were favorable. At times when the Pythia was not operating, consultants allegedly obtained information about the future in other ways at the site, through the casting of lots, using a simple questioning "Yes/No" device, or by seeking counsel from [[dream]s.
It would appear that the supplicant to the oracle would undergo a four stage process, typical of shamanic journeys. Step 1: The Journey to Delphi - Supplicants were motivated by some need to undertake the long and sometimes arduous journey to come to Delphi in order to consult the oracle. This journey was motivated by an awareness of the existence of the oracle, the growing motivation on the part of the individual or group to undertake the journey, and the gathering of information about the oracle as providing answers to important questions. Step 2: The Preparation of the Supplicant - Supplicants were interviewed in preparation of their presentation to the Oracle, by the priests in attendance. The genuine cases were sorted and the supplicant had to go through rituals involving the framing of their questions, the presentation of gifts to the Oracle and a procession along the Sacred Way carrying laurel leaves to visit the temple, symbolic of the journey they had made. Step 3: The Visit to the Oracle - The supplicant would then be led into the temple to visit the adyton, put his question to the Pythia, receive his answer and depart. The degree of preparation already undergone would mean that the supplicant was already in a highly aroused and meditative state, similar to the shamanic journey. Step 4: The Return Home - Oracles were meant to give advice to shape future action, that was meant to be implemented by the supplicant, or by those who had sponsored the supplicant to visit the Oracle. The validity of the Oracular utterance was confirmed by the consequences of the application of the oracle to the lives of those people who sought Oracular guidance. There have been occasional attempts to find a scientific explanation for the Pythia's inspiration. Most commonly, these refer to Plutarch's observation that her oracular powers appeared to be linked to vapors from the Castalian Spring that surrounded her, together with the observation that sessions of prophesy would either take place in, or be preceded by, a visit to an enclosed chamber at the base of the temple. For a long period, Mestrius Plutarch (ca. 45 - 125 C.E.) had presided over the Delphic Oracle as a priest at the site. It has often been suggested that these vapors may have been hallucinogenic gases. The first excavation of Delphi conducted by a French team led by Theophile Homolle of the College de France from 1892 to 1894 and reported by Adolphe Paul Oppé in 1904, stated that there were no fissures and no possible means for the production of fumes. Oppé flatly stated that the French excavations had found no evidence for a chasm underneath the temple. Following this definitive statement, such scholars as Frederick Poulson, E.R. Dodds and Joseph Fontenrose, all stated that there were no vapors and no chasm. A recent re-examination of the French excavations, however, has shown the possibility that this consensus is mistaken. William J. Broad, in 2006, demonstrates that a French photograph of the south west corner of the temple, taken at the time where the team had excavated down to the bedrock, not only clearly demonstrated the presence of a water-filled pit beneath the temple, but also demonstrated numerous fissures, suggesting numerous pathways by which any intoxicating vapors present could enter the base of the temple. In 2001, evidence of the presence of ethylene, a potential hallucinogen, was found in the temple's local geology and nearby springs by an interdisciplinary team of geologist Jelle Zeilinga de Boer, archaeologist John R. Hale, forensic chemist Jeffrey P. Chanton, and toxicologist Henry R. Spiller. Ethylene in the highest concentrations was found in the waters of the Kerna spring, immediately above the temple. Although in small quantities, currently the waters of the Kerma spring are diverted from the site for use by the nearby modern town of Delphi. Currently, it is unknown the degree to which ethylene or other gases would be produced at the temple should these waters be allowed to run free, as they did in the ancient world. Not often nor regularly, but occasionally and fortuitously, the room in which the seat the god's consultants is filled with a fragrance and breeze, as if the adyton were sending forth the essences of the sweetest and most expensive perfumes from a spring (Plutarch, Moralia, 437c). Only ethylene of all of the hydrocarbons has such an odor. Inhalation of ethylene in an enclosed space in which the Pythia was separated from the supplicant by a screen or curtain of some kind, it was argued, exposed the Pythia to sufficiently high concentrations of the "narcotic gas" to induce a mildly euphoric or trance-like state. Frequent earthquakes, produced by the fact that Greece lies at the intersection of three separate tectonic plates, seem to have been responsible for the observed cracking of the limestone, and the opening up of new channels by which hydrocarbons enter the flowing waters of the Kassotis (well). This would cause the amounts of ethylene emitted to fluctuate, increasing or decreasing the potency of the drug released, over time. It has been suggested that the decline in the importance of the Oracle after Hadrian (76 – 138 C.E.} was in part due to the fact that there had not been an earthquake in the area for a significant length of time. In the early twentieth century, an anaesthesiologist named Isabella Herb found that a dose of 20 percent ethylene gas administered to a subject was a clear threshold. A dosage higher than 20 percent caused unconsciousness. With less than 20 percent a trance was induced where the subject could sit up, hear questions and answer them logically, although the tone of their voice might be altered, their speech pattern could be changed, and they may have lost some awareness of their hands and feet, (with some it was possible to have poked a pin or pricked them with a knife and they would not feel it). When patients were removed from the area where the gas accumulated they had no recollection of what had happened, or what they had said. With a dosage of more than 20 percent, the patient lost control over the movement of their limbs and may thrash wildly, groaning in strange voices, losing balance and frequently repeatedly falling. In such cases, studies show that shortly thereafter the person dies. According to Plutarch, who witnessed many prophecies, all of these symptoms match the experience of the Pythia in action. Plutarch said that the Pythia's life was shortened through the service of Apollo. The sessions were said to be exhausting. At the end of each period the Pythia would be like a runner after a race or a dancer after an ecstatic dance. It clearly had a physical effect on the health of the Pythia. Dr. Henry A. Spiller, the toxicologist of the team, who directs the Kentucky Regional Poison Center, says "In the first stages, it (the ethylene found) produces disembodied euphoria, an altered mental status and a pleasant sensation. It's what 'street' people would call getting high. The greater the dose, the deeper you go." ↑ Catherine Morgan. Athletes and Oracles: The Transformation of Olympia and Delphi in the Eighth Century B.C.E. (Cambridge University Press, 2007), 148. ↑ For an example, see Farnell 1907, p. 189. ↑ Joseph Eddy Fontenrose. The Delphic Oracle: Its Responses and Operations. Univ of California Press, (1978) 1981. ISBN 0520043596), 196-227; Maurizio 2001, 38-54. ↑ Henry A. Spiller, John R. Hale, and Jelle Z. de Boer. "The Delphic Oracle: A Multidisciplinary Defense of the Gaseous Vent Theory." Clinical Toxicology 40(2) (2000): 189-196. John R. Hale, Jelle Zeilinga de Boer, Jeffrey P. Chandon and Henry A. Spiller, "Questioning the Delphic Oracle," Scientific American (August 2003). ↑ Betsy Mason, The Prophet of Gases in ScienceNow Daily News, October 2, 2006. Retrieved 11 October 2006. ↑ John Hale quoted in an interview on the radio program "The Ark," presented by Rachael Kohn, Sunday January 9, 2005,transcript available abc.net.au. Retrieved November 11, 2008. ↑ Hugh Bowden. Classical Athens and the Delphic Oracle: Divination and Democracy. (Cambridge University Press, 2005), 15-16; see also Herodotus 8.36, Euripides, Ion, 413-416. ↑ Martin Litchfield West. The Orphic Poems. (Oxford University Press, 1983), 147. ↑ William J. Broad, pp. 146-7: "[A] French photo of the temple's interior showed not only a spring-like pool but fissures… in the bedrock, suggesting a specific pathway by which intoxicating gases could have risen into the oracle's sanctum…. What delighted de Boer so much was not the verification of the spring-like pool at the heart of the chasm, as the revelation of the bedrock's composition… there right above the waterline, the photograph clearly showed vertical fissures running through the bedrock. No denial could hide that fact, no scholarly disclaimer could deny the reality…. [The] cracks …[showed] evidence of tectonic jolts and protracted flows of mineralised water." ↑ In the French excavation report on the temple, Fernand Courby shows that the adyton was unlike adyta found in other temples as it was not central, but on the south western side, interrupting the normal symmetry of the Doric temple. It was divided into two areas, one small area 9 by 16 feet for the oracle, one for the supplicant. Modern research reported by Broad, p. 37, suggests that both the supplicant and the Pythia descended a flight of five steps into a small room within the temple with its own low ceiling. Walter Miller has argued that the stone block 3.5-4 feet, that Courby described as being part of the floor, was in fact the site where the oracle sat. It showed a square 6 inch hole, that widened to 9 inches, immediately under the triangular grooves for the tripod. Strange channels, possibly to carry water from the spring, surrounded the tripodal grooves. That these had, in fact, carried waters for long periods was confirmed by the layers of travertine that encrusted it. Nothing like this has been found at any other Greek temple. Holland (1933) argues that these channels and the hollow nature of the omphalos found by the French were to channel the vapors of intoxicant gases. ↑ Quote taken from an nytimes.com article by William J. Broad - Fumes and Visions Were Not a Myth for Oracle at Delphi, March 19, 2002. Retrieved November 11, 2008. Bowden, Hugh 2005. Classical Athens and the Delphic Oracle: Divination and Democracy. Cambridge University Press. ISBN 0521530814. Broad, William J. 2006. The Oracle: the lost secrets and hidden message of ancient Delphi. Penguin Press. ISBN 1594200815. Fontenrose, Joseph Eddy. The Delphic Oracle: Its Responses and Operations. Univ of California Press, (1978) 1981. ISBN 0520043596. Hale, John R., Jelle Zeilinga de Boer, Jeffrey P. Chandon and Henry A. Spiller, "Questioning the Delphic Oracle," Scientific American (August 2003). Holland, Leicester B. "The Mantic Mechanism at Delphi," American Journal of Archaeology 37 (1933): 201-214. Morgan, Catherine. 2007. Athletes and Oracles: The Transformation of Olympia and Delphi in the Eighth Century B.C.E. Cambridge University Press, ISBN 978-0521035682. Spiller, Henry A., John R. Hale, and Jelle Z. de Boer. "The Delphic Oracle: A Multidisciplinary Defense of the Gaseous Vent Theory." Clinical Toxicology 40(2) (2000): 189-196. West, Martin Litchfield 1983. The Orphic Poems. Oxford University Press. ISBN 0198148542. National Geographic article John Roach, for National Geographic News, August 14, 2001, describes how ethylene might have been released into the environment and provoked "oracular" activity. This page was last modified on 18 June 2015, at 15:46.